Hi Kate! How did 2018 round up for you? 2018 had a lot of ups and downs, but ultimately was a great learning year. A ton of awesome things happened for my skating though! The highlight was getting on Monster Army for sure. It opened up a lot of doors for me and my skating. 2019 is set up to be absolutely insane! Events, Demos, and so much more I can't even talk about yet! But most importantly, loads of skateboarding! Do you have a trip/contest planned for this upcoming year that you’re most excited about? I've got my annual trips to Seattle to visit family and skate the rad parks up there. I'll be skating a bunch of Contests, including my favorite Exposure. I'm going into a new division this year and couldn't be more stoked! I'm always inspired by one of my mentors, Kurtis Colomonico. He's always helping me and a ton of other kids progress. All the Bones Brigade guys are a huge inspiration to me too. Favorite thing to do when you’re not skating…. When I'm not skating, you can find me at the softball field. Its really rad to be able to put the lessons I learn from softball into my skating. Plus it makes me a better athlete which is pretty cool. My moms breaded chicken for sure. She makes the best food. I like a ton of stuff, Indie, rap, but Punk will always be my favorite. I like Suicidal Tendencies, Agent Orange, Adolesents, and the list keeps on going. For a day during the school year... Wake up, go skate at 6:15 a.m., head to school at 7:30 until 2:40 with softball ending at 3:30ish, come home grab a quick bite, and skate in my backyard until dinner, do homework and go to bed. On the weekends, its skate anytime someone will take me! Any last thanks you or shout outs? Shout out to my family and sponsors! 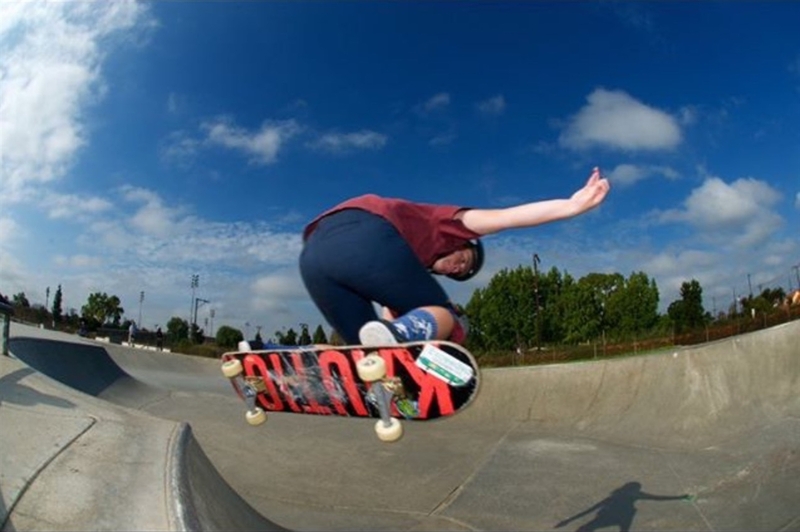 Big shout out to Robb Wilson for taking me and the homies skating in the mornings before school and taking all my rad pictures. Shout out to the 56 squad and to the parents for being the best skate taxi's!